NEW YORK—Standing slightly crouched with her fists raised up in front of her in the middle of her campaign office’s mock stage, a blindfolded Hillary Clinton reportedly implored her high-level staffers to attack her with talking points from all sides Wednesday in preparation for next week’s first presidential debate. 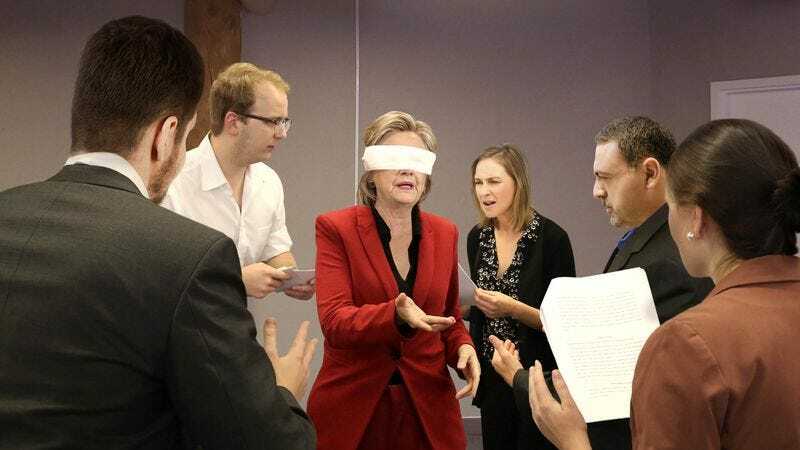 “Let’s do this—I want all of you to come at me with everything you’ve got: Benghazi, my Iraq War vote, the Keystone XL pipeline, everything,” said Clinton to the circle of aides surrounding her as she began jabbing and thrusting her hands through the air in forceful gesticulations, skillfully dodging rhetorical blows and deflecting a barrage of vicious critiques of her email practices as secretary of state, all while maintaining her poise and balance. “Stop trying to hit me with accusations of flip-flopping on the Trans-Pacific Partnership and hit me, dammit! Don’t hold anything back!” At press time, Clinton had spun completely around on the issue of her financial ties to Wall Street and then shifted herself hard to the right to avoid an aggressive charge of being soft on crime, leaving her completely unscathed while her exhausted aides huffed and puffed in defeat.